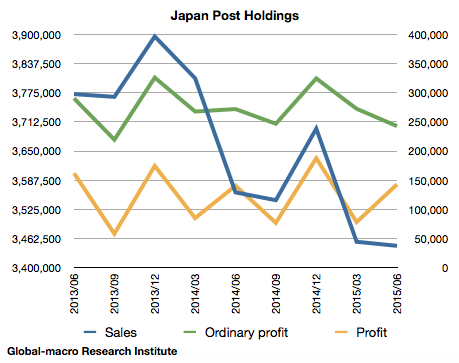 We first review the sales, the ordinary profit and the profit of Japan Post Holdings. We recognize the sales is moderately declining, whilst the profit remains at the same level, resisting the decreasing sales. 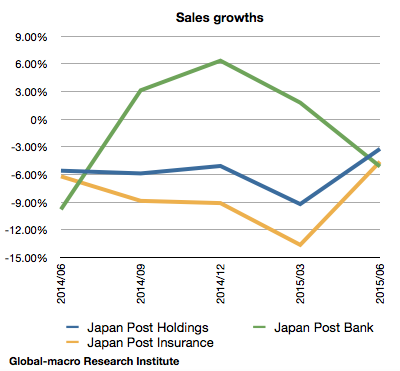 Japan Post Bank engages itself in such businesses as savings and mortgage loans. The trends of the sales and the profit are similar to those of the holding company. 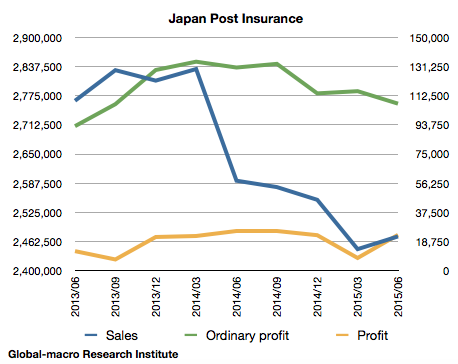 The financials of Japan Post Insurance also holds similar trends, partly because the insurance company’s large number of the sales affects the sales of the holding company very much. To make it clear, there is a graph that shows the sales growths of the three companies. We observe the negative growths. Their efforts to reduce the costs are making their profit more stable than their sales, but they cannot continue the cost reduction forever without relieving itself of the essential cause of the sales slump. The essential problem is that they lack appeal to younger generations. The main clients of the bank and the insurer are mostly elderly people with limited financial literacy; the old Japanese tend not to trust private financial firms but to trust governmental organizations such as Japan Post. As a result, Japan Post Bank keeps savings of as much as $1.4 trillions, and most of it comes from the generations that had limited choices to put their savings. However, for the younger generations in Japan, Japan Post Bank is merely one of the banks they consider to open an account, so that we expect the huge market share of Japan Post Bank will gradually move to other banks. The case is the same with Japan Post Insurance. The elderly Japanese would not trust private insurers but Japan Post Insurance. However, the younger generations have a plenty of choices. As a result, after a decade and changes of generations, we doubt the possibility that Japan Post should keep the share of the clients. For Japan Post Bank, the quality of the savings is also an issue. Unlike the old Japanese with limited literacy, the richer, old Japanese tend to entrust their money to banks and leave few assets in Japan Post Bank, so that the other commercial banks gain more commissions for asset management. In addition, Japan Post Bank basically manages the clients’ savings by purchasing the government bonds, which only produce a tiny yield under the quantitative easing of the Bank of Japan. The bank finally decided to buy riskier assets recently, but our regular readers would understand the meaning of buying risk assets at this timing. The most decent company out of the four is actually Japan Post, the postal service company, but it is not going to be sold this time. The company maintains post offices in rural areas for public convenience, and it is known that most of them produce losses. If the company became private, it would be able to close unprofitable post offices and would see tremendous improvement in profit margin, but it would not happen for some years. Should we buy these IPOs? In conclusion, we ironically observe that the government was hurried to sell the sales-declining companies while there is a stock boom thanks to the QE, while the government still keeps the essentially profitable Japan Post. Consequently, for investors this is an issue of with how much discount we can buy these decaying companies. The P/B ratios look quite inexpensive, but this is also a result of their very low profit margins. The highest P/B is Japan Post Insurance, but it could be difficult to buy at the P/E ratio of 16, especially in a long term, as we expect difficulties for the insurer to appeal to younger generations. 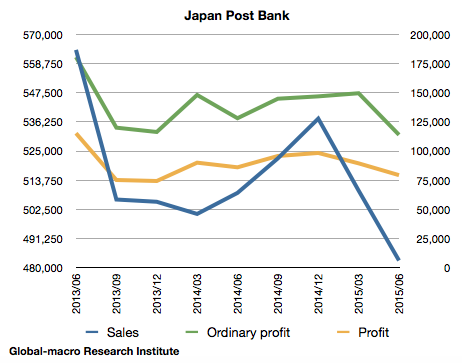 Also, if you consider to buy Japan Post Bank, you would need to wish that the bank’s strategy to join the QE bubble at the end the party would not turn out to merely hurt the profit. As a result, only Japan Post Holdings looks worth criticizing, since the holding company includes the bank and the insurer of the high P/E ratios and still keeps its P/E as low as 12.99. This means Japan Post, the company that is not for sale this time, is extremely undervalued. Theoretically, we can produce a position to buy unsold Japan Post by buying the holding company and short selling the bank and the insurer, but there also is a risk as the shares of Yahoo!, for example, did not reflect the value of Alibaba shares it once had. The market’s reaction is not always theoretical. Above all, investors would need to be more careful about the IPOs’ influence on the liquidity of the Japanese equity market. The total size of these IPOs is $11 billions, which means these IPOs are set to absorb almost a half of the liquidity the BoJ annually provides by its ETF purchase. The cause of Black Monday was of course not related to the public offering itself as we explained in the following article, but it would be better to be careful as the current market volatility is similar to then. The Japanese government is expected to sell more of the stocks of the three companies in the future, but it would count on how long the QE can maintain the stock boom further.